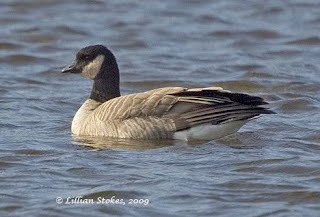 We have been talking about Cackling Geese showing up in the East, see my other blog post here. These geese, who mainly nest in the arctic, look like very small Canada Geese, but are a different species. There are 4 subspecies of Cackling Goose. 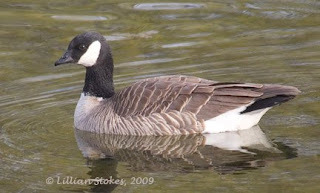 It is thought that the subspecies who usually shows up in the East is the nominate subspecies, Branta hutchinsii hutchiinsii, (also sometimes called "Richardson's Goose", "Richardson's Cackling Goose" or "Hutchins's Goose"). This is a photo I took in western Massachusetts on 11/8/09 is of the hutchinsii subspecies (confirmed by experts). ID of Cackling subspecies emphasizes head and bill shape. This bird in my photo has a short bill, a short, steeply rising forehead, a rather flattened crown rising to a bit of a peak at the back of the head, all characteristics of the hutchinsii subspecies. Most hutchinsii also have a narrowing of the white of the cheek patch at the level of the eye, also visible on this bird. This bird also has a very pale breast, as have the majority of hutchinsii. The back and sides are also pale, the back does not appear darker than the sides. There's noticeable pale edges to the wing covert feathers, creating pale diagonal lines. Cackling Geese cannot always be identified as to subspecies, as with the above and following photos of an individual I photographed in Ohio (east of Toledo) in May 2005. Several experts concur that this might be a hutchinsii subspecies or possibly an intergrade between the taverneri and hutchinsii subspecies, but it cannot be definitively identified. To quote the excellent article on Distribution and Identification of Cackling Goose Subspecies by Mlodinow et al. "though birds breeding on the continental Arctic slope from the Mackenzie River west are thought to be taverneri, the precise border between taverneri and nominate hutchinsii has not been defined, nor has the degree of potential or actual intergradation between the two (J. Leafloor, J. Pearce, D. Derksen, pers. comm.)." 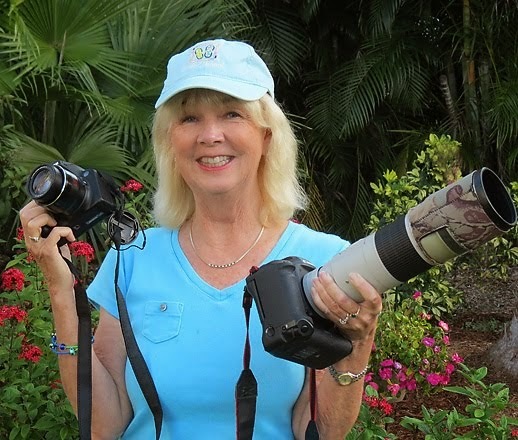 This bird shows a more rounded head than the hutchinsii bird in my top photo, with a more gradual slope from the bill to the head, more characteristic of taverneri. Taverneri subspecies have "stout and somewhat triangular bills". The breast of this bird is pale. Taverneri are "typically medium-gray-breasted, becoming darker on belly/flanks" according to the article. However, sometimes they can have pale breasts. 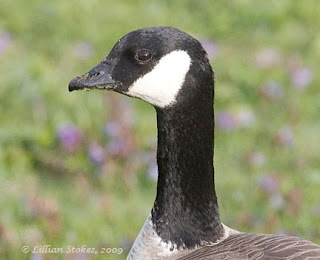 Here's the neck fully upright in an alert posture of the goose. The head looks faintly flattened and there's white flecking at base of the black neck, suggesting a very thin white neck collar. The article estimated that only 2-5% of taverneri adults have a neck collar and that about 10-20% of hutchinsii can have a neck collar. Here's another posture with the head looking somewhat flattened. Note that under the chin you can see a thin black line running from bill to the black neck, called a gular stripe. 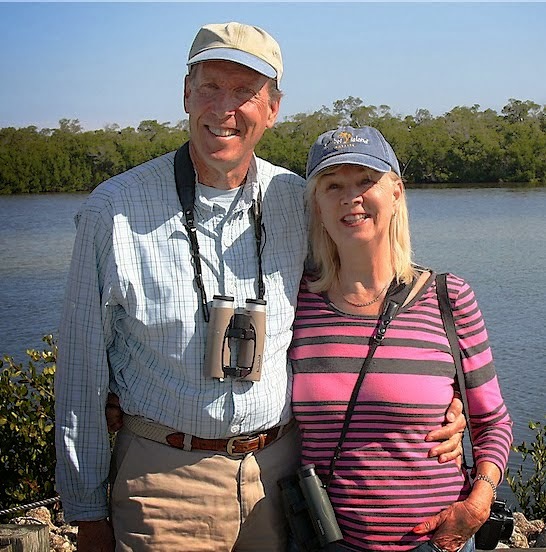 This is seen in up to 25% of hutchinsii, whereas 40-75% of taverneri have a gular stripe according to the article. Here's another posture where the neck looks short. Cackling Geese of the hutchinsii subspecies mainly winter along the Gulf Coast from southeastern Louisiana down into Mexico and also from eastern Colorado to eastern New Mexico through western Texas and into Mexico. 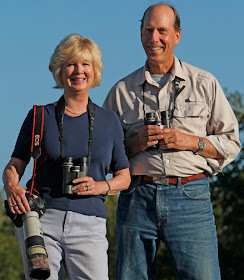 Of the Cackling Geese that show up outside of their normal wintering range and stray to the East in small numbers, almost all reports have been of the hutchinsii subspecies. They have been reported from Indiana, Ontario, western New York, southern Quebec and Nova Scotia down to Virginia with a few reports to North Carolina, South Carolina and a few from Florida. Taverneri subspecies winters in mainly Washington and Oregon, although some may winter in the continent's center. There are few reports of taverneri in eastern North America. There's a record from Onondaga county, New York, Sept. 2004, Janesville, Wisconsin, Oct. 2004, Amherst, Mass. Oct. 2007 and maybe the same bird in Middlefield Conn. Nov. to Dec. 2007 for photos of this bird see here. 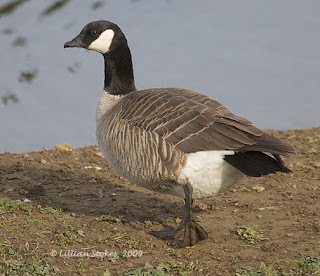 The other two subspecies of Cackling Geese are leucoparia and minima. 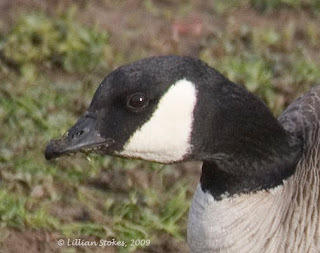 Minima (called Ridgway's Goose) is the smallest and darkest of the subspecies and winters mainly in western Oregon and Washington and central California. Only a handful or so of reports for minima exist for east of the Mississippi and are for North Carolina, Illinois, Connecticut, Alabama, Virginia and Tennessee. Leucoparia (called Aleutian Goose) a medium-sized Cackling, has a broad, white, complete neck collar on all adults. It winters mainly California and a little in Oregon and there are no winter records for east of the Mississippi River that we know of. So keep looking at Cackling Geese in the East, there may be other subspecies showing up besides hutchinsii. If you find them, let us know. 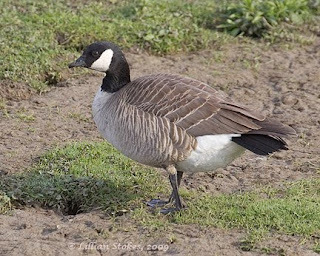 For more details, consult Distribution and Identification of Cackling Goose Subspecies, by Mlodinow et al. 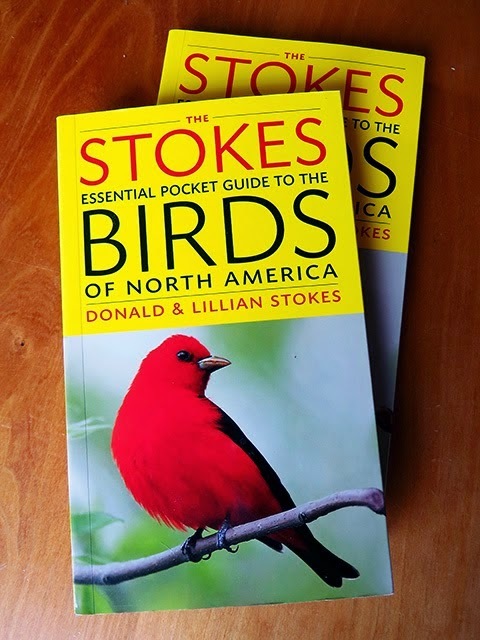 North American Birds, vol. 62, no. 3, 2008, pages: 344-360. 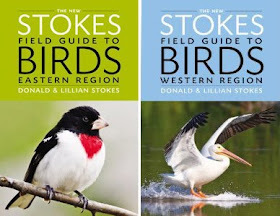 This is great, was wondering about these last winter! Thanks a ton! 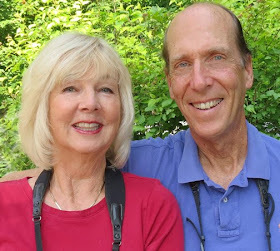 Lillian and Don, I just returned from my vacation, and attempting to catch up with all my blogs. 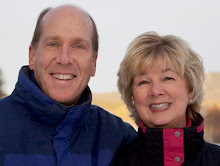 I'm so glad I saw this post because my husband and I were on the Colorado-New Mexico border driving through Sugarite Canyon State Park (NM). There is a Lake Montoya there on the Colorado side and that's where we saw a flock of about two-three dozen on the lake of what we thought were Canada geese. But, I kept telling my husband they were too small to be Canada geese. So your post has aptly explained what we saw. 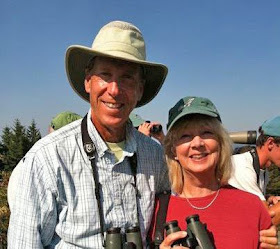 I guess the subspecies we probably saw was the Taverneri subspecies, and possibly on their way to Texas? Feeder Friday, Where Are The Birds, Really? ?